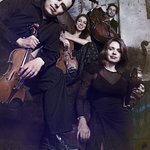 The musicians of Cuarteto Q-Arte – Juan Carlos Higuita and Liz García on violin, Sandra Arango on viola and Diego García on cello – are recipients of a vast body of work, both in their native Colombia and more widely in string quartet literature. All four players work at universities conducting what they call “investigative work” in Latin American traditions. To further seed the field for future generations, Cuarteto Q-Arte teach lessons and masterclasses and stage festivals like their own biennial, FestiQ-Artetos. 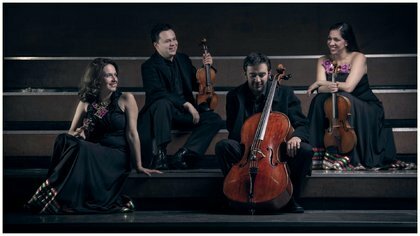 Cuarteto Q-Arte were founded in 2010, and they have performed their buoyant, lively music all over the world. 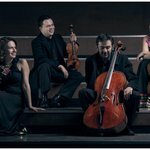 This energy – like the buzz from a stiff cup of coffee at Juan Valdez – informs every Cuarteto Q-Arte performance: even somber tunes morph into bouncy numbers with instrumental percussion, singing and improvisation. Cuarteto Q-Arte heavily, but not exclusively, favor a particular style of music. The effect is universally pleasing.